The Rogue Traders team decided to investigate Perfect Turf of Purley however they needed help from someone in the know. 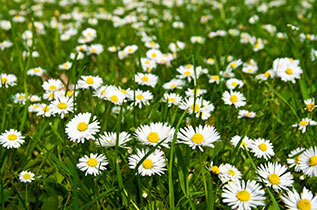 They turned to Dr Tim Lodge an expert in all things lawn related – he even has a PhD in Turf Maintenance. Read the full BBC Rogue Traders story here. In association with Mia Witham of Forma Landscapes, Agrostis now provides a complete garden design and installation service. Blending Agrostis' extensive knowledge and experience of specification and contract preparation, procurement and project management with Mia's passion and understanding of gardens and outdoor spaces, we provide the 'one stop' solution for your garden design and installation needs. You'll obviously benefit from our understanding of all things turf-related with regard to the development of your lawn, whatever kind of lawn that is. 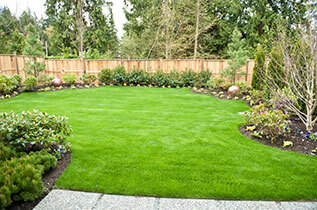 A lawn is something we would hope you'd like to include if you're planning to redevelop a garden. 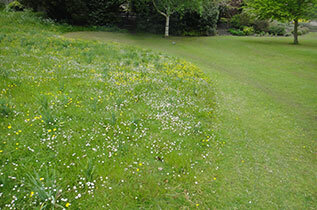 They are considered to be quintessentially English, yet the total area of lawns in the UK is in decline. We are trying our hardest to reverse this trend. Working with Mia has established our capacity to provide a comprehensive garden design and installation service extending right up to the garden fence. As a qualified and experienced landscape designer, Mia's passion is the perfection of the spatial arrangement of outdoor spaces in relation to personal well-being. This is simultaneously both an ancient and a modern philosophy that we feel is fundamental to successful garden design. If you're planning to create a new garden, first of all we'll need to get to know a little about you and what your general objective and roughly what your budget is. Are you looking for a wildlife garden, an ornamental garden, a children's play garden, something unique that only you can tell us about, several or all of the above? We'd also need to see the space you're working with for ourselves. Having paid you a visit, we'll then provide you with a quotation covering the cost of the design and an estimate of how much we believe the implementation of our design would cost. 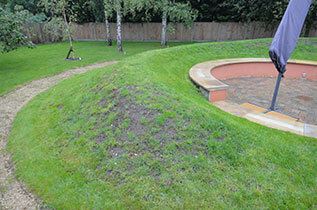 Call 01359 259361 or email if you'd like to hear more about our garden design service or to arrange an appointment. We’d hate you to be subjected to the kind of shoddy practice exposed by the BBC ‘Rogue Traders’ episode in which our very own Tim Lodge appeared as ‘the expert’. So we’ve come up with a new way for would-be lawn owners to achieve best value at the right price when establishing a new lawn. We do this by providing a detailed specification of the work, tailored to your individual requirements. You can either undertake the work yourself as it is set down, or you can hand the documentation to several contractors able to do the work for you. We would suggest at least three. If they agree to do all of the work exactly as we describe then you can select the contractor who will do this for the lowest price and away you go. This way you get the benefit of the project design, procurement and management skills of one of the most experienced turf consultancies in the country at a fraction of the cost because you don’t have to pay us to come and see you. Whether to turf or seed? You need to make this decision early on. Some of the advantages and disadvantages of each are summarised below. June or July is OK but be prepared to water regularly. ‘Standard’ seed is around 10p per square metre. Late autumn to early spring. Avoid May to Sept or be prepared for a lot of watering. 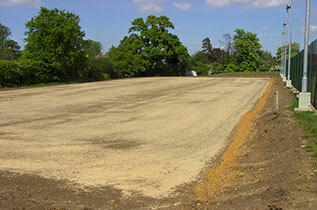 ‘Standard’ turf is around £4 per square metre. The size of the lawn will obviously dictate how much it’s all going to cost. Sometimes the soil is too heavy and drains badly. Sometimes there isn’t enough soil to sustain good grass growth. You’ll need to think about this to get the best lawn for you. Or we’ll just assume you have a suitable soil for a lawn. We’ve reduced the options to just 3; shaded, hard wearing and ornamental, mainly because the ground preparation is more or less the same whatever the type of lawn you’re after. There is a wide range of options available, however, particularly if growing from seed. We’d be happy to advise you further on this; just get in touch. Our tailored lawn installation contract is available for just £35! 1. Download the form to your computer, open with Acrobat Reader and fill in your details. 2. Click the PayPal button and make a payment of £35 through our PayPal account. 3. Click the 'Submit' button to email your completed form. We’ll send you your personalised contract documentation within 24 hours (the time we need to get this right for you), Monday to Friday (excluding weekends and bank holidays). If we have any queries we’ll come back to you via email. Among other things, this part of the documentation is to make sure your contractor doesn’t leave your garden or the road outside in a mess, that they operate according to all the relevant health and safety procedures and that they don’t do anything that would be damaging to you, your property or the environment. This is a detailed list of each of the procedures which must be undertaken in order that you achieve the best lawn your circumstances will allow. This, and the bills of quantities, is tailored to your individual requirements as set down in the form you provided for us and is based on our many years’ experience in turf establishment. This illustrated document provides a lot more detail on each of the procedures involved and provides advice on the appropriate selection of materials, seed, turf, sand, fertiliser etc. It also explains how you should look after your new lawn once it has been established. This is a simple list of all the jobs to be done by the contractor and the quantities of materials that are necessary. The contractor should itemise their quote according to this list so that you can see exactly what you are getting for your money. Here the contractor states how much he or she is prepared to undertake the work for, the bottom line of the bill of quantities. If you are happy with the price offered by any one particular contractor you should sign two copies, hand one back to the contractor and the work can then go ahead. You are promising to pay the contractor the relevant sum for the work and at the appropriate time and the contractor is promising to do the work as it is set down in the documentation. Free telephone advice (within normal office hours) – just call us and we’ll try to answer any technical questions you may have about your lawn. Free email advice – email us and we’ll try to get back to you within 24 hours. All of our other services are of course available at our commercial rates. Please contact us to discuss your specific requirements. 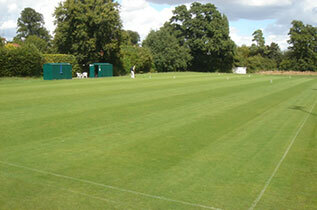 Completed croquet lawn built to Agrostis specification. Prominent landscaping is not always good for lawn cover.